Our gourmet European cakes are handmade in-house, from traditional and original recipes, to offer you a unique experience of taste, quality, and creativity. To honor our passion and love for fine cakes, we use only natural and high-quality ingredients, no preservatives and we rely on our expert skills and craftsmanship to bake and decorate our cakes. Our signature cake is an elegant and rich dessert, with a velvety texture of soft walnut meringue and chocolate ganache, a luxurious treat for any celebration. This unique delightful cake is a combination of soft walnut merengue and light vanilla cream, with a layer of coffee-soaked biscuits. Our very own recipe. Our traditional chocolate cake: chocolate buttercream-filled chocolate cake, soaked in rum syrup, coated with chocolate (original recipe). Profiterole is one of the most spectacular cakes created as a beautiful tower of cream puffs held together with light, airy chocolate cream, drizzle with chocolate. Our traditional creamy vanilla mousse topped with real whipped cream, filled with fresh fruits to deepen the flavor of this light-as-air cake. GLUTEN FREE. Layers of light Joconde cake, soaked in coffee syrup, hazelnut and espresso buttercream, make Opera cake the showstopping dessert. This light-as-air mousse is a combination of different berries, creating an irresistible aroma which makes every bite just so delectable. To compliment the lightness, we finished it with in house made fruit puree and fresh fruits. GLUTEN FREE AND EGGLESS. This light-as-air chocolate mousse is a combination of dark chocolate, milk chocolate and white chocolate. GLUTEN FREE AND EGGLESS. Smooth, chocolatey sponge smothered with rich cream cheese icing is the beautiful indulgence of red velvet cake. Decadent chocolate cake layers, complemented by layers of swirls raspberry buttercream, for a spectacular and delicious cake. 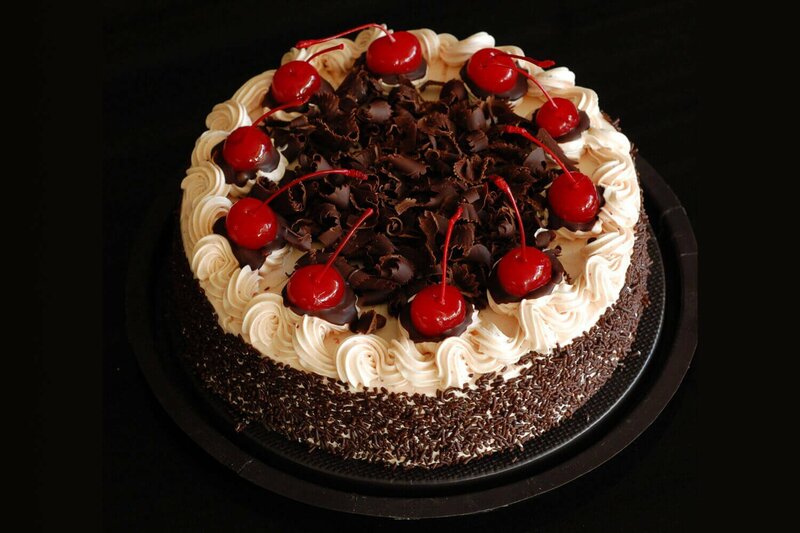 Decadent chocolate cake with deep rich flavours of sour cherry and cherry liquor, complimented by real whipped cream. This delicious-looking cake where the chocolate ganache and your favourite flavour cake make a wonderful pairing is always a crowd pleaser. The delicate flavours of layers of Mascarpone and ladyfingers biscuits are contrasted by the robust presence of espresso and sharpness of cocoa powder. A wonderful Hungarian cake made with thin layers of sponge cakes filled with rich chocolate buttercream and topped with a brittle caramel layer. Named for the French patron saint of pastry bakers, St. Honore is made of light pastry dough, filled with custard cream, decorated with real cream and coated with caramelized sugar. Dense, decadent chocolate cake soaked in syrup, embracing a light, airy chocolate ganache cream. Perfection in chocolate. This extraordinary flowerless cake is the delightful combination of crisp meringue layers with bittersweet chocolate cream or cream and berries. GLUTEN FREE. Layers of pâte sablée, filled with dollops of cream or chocolate ganache, and topped with a medley of fresh fruit, macaroons, flowers, meringue kisses, candy and more. It’s the latest dessert trend. At CASA ROMANA your custom cake dreams come to life. Working closely with you, we use top of the line equipment and techniques to ensure that your dream cake will WOW even the most demanding guests. Whether it’s your Birthday, Baby Shower, Grand Opening or Special Event, we combine your ideas and our expertise to create a cake deserving of your special moment. For more design options come and check our in-store catalog. Let us make your most important celebration reflect what makes you unique by making a cake to suit you perfectly. Combining affordability and beauty, and never compromising in quality, all our cakes are hand made, using only natural and high-quality ingredients with no preservatives. If you are looking for a cake that looks spectacular and tastes amazing, you came to the right place.